Perfectly stackable! Our Ziza Mini Med ID Cuff is a Lauren’s Hope original, designed in our Kansas City studios. 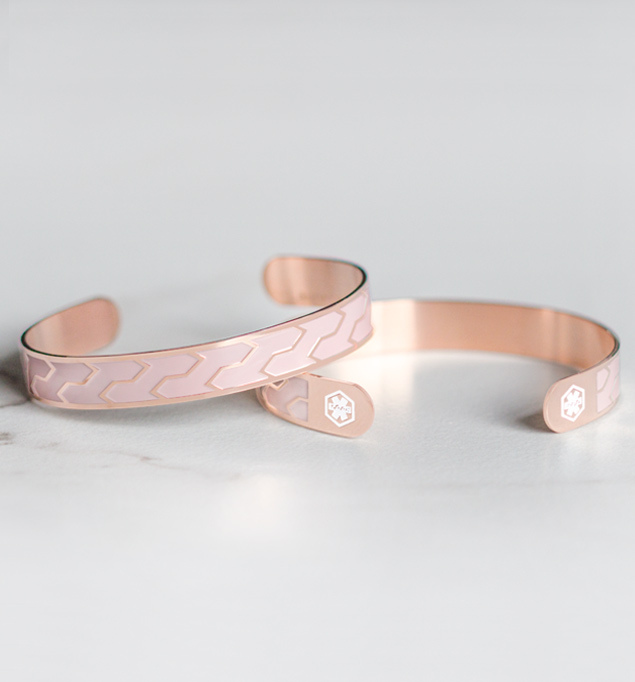 This hypoallergenic, stainless steel medical alert cuff features a warm rose gold tone finish and a petal pink inlay for durable, lasting bracelet with a delicate, feminine look. Both ends of your Ziza Mini Med ID Cuff feature the universally recognized medical caduceus symbol, alerting first responders to your medical information, which we can engrave on the inside. Our women’s medical ID cuffs are an excellent option for ladies who want flexibility in their medical ID jewelry. By simply pulling gently on either end of your medical ID cuff to open it wider, then squeezing it gently to the desired fit after putting it on, you can adapt your medical ID’s fit with every wearing. This makes medical alert cuffs ideal for women who have had weight loss surgery and want a great fit every step of the way along their weight loss journey. Medical ID cuffs are also excellent options for women living with lymphedema, arthritis, dexterity challenges, and other conditions that may cause swelling of the extremities or difficulty manipulating bracelet clasps.